This species is accepted, and its native range is SW. Uganda to Burundi. Leaves elliptic or ovate, normally ranging from 7 x 4 mm. to 19 x 11 mm., obtuse at the apex, sessile, cordate and clasping the stem at the base, furnished with minute inconspicuous translucent glandular dots, as well as more conspicuous opaque glandular dots on the lower surface. Leaves elliptic or ovate, normally ranging from 7 × 4 mm. to 19 × 11 mm., obtuse at the apex, sessile, cordate and clasping the stem at the base, furnished with minute inconspicuous translucent glandular dots, as well as more conspicuous opaque glandular dots on the lower surface. Flowers single, sometimes appearing axillary; pedicels 8–25 mm. long. Flowers single, sometimes appearing axillary; pedicels 8–25 mm. long. Sepals unequal, ± lanceolate, furnished with translucent glandular dots and dashes. Sepals unequal, ± lanceolate, furnished with translucent glandular dots and dashes. Petals 6–8 mm. long, orange to yellow, without marginal dots. Petals 6–8 mm. long, orange to yellow, without marginal dots. Stamens in 3 groups of 12–15. Stamens in 3 groups of 12–15. Glabrous perennial herb with prostrate, procumbent or ascending stems up to 3 dm. high, rather slender, quadrangular. Glabrous perennial herb with prostrate, procumbent or ascending stems up to 3 dm. high, rather slender, quadrangular. Swamps in upland grassland, 2100–2400 m. Swamps in upland grassland, 2100–2400 m.
eastern Belgian Congo - known only from the Virunga Mts. and other nearby mountains, Burundi; U2 U2 eastern Belgian Congoknown only from the Virunga Mts. and other nearby mountains. Bamps in Distr. Pl. Afr. 3, map 70 (1971). N. Robson in Kew Bulletin 12: 445 (1958). Milne-Redh. in Flora of Tropical East Africa, Hyperic. : 12 (1953). Gillett & Milne-Redh. in Kew Bulletin 1950, 343 (1951). 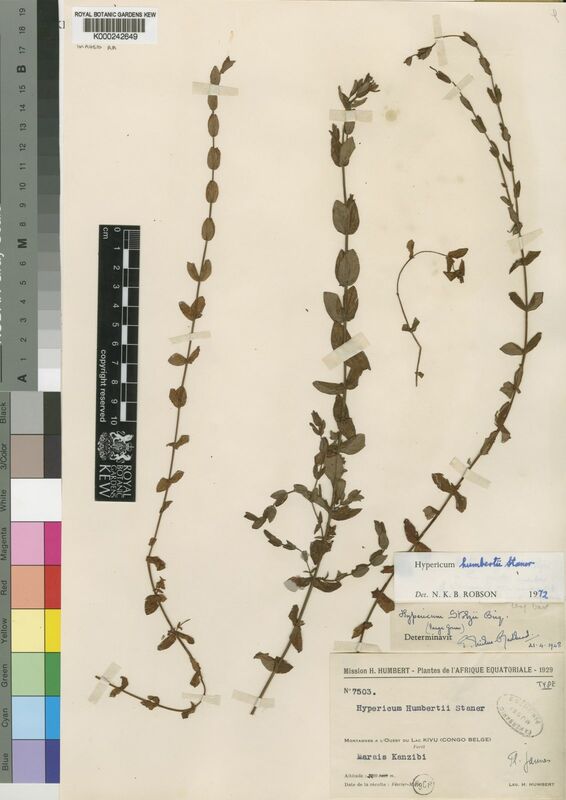 Robyns, Flore des Spermatophytes du Parc National Albert 1: 619 (1948). 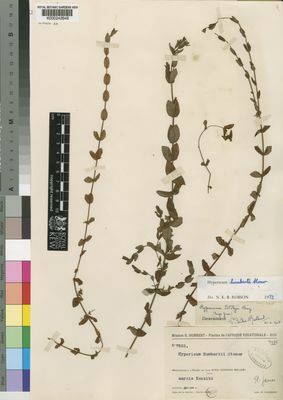 Staner in Bulletin du Jardin Botanique de l'État a Bruxelles 13: 69 (1934). Starner in Bulletin du Jardin Botanique de l'État a Bruxelles 13: 69 (1934).